With full spectrum sound the nuances of bat signals can be parsed from a noise floor. We can take advantage of this to find and work with bat calls that would have been lost in zero cross analysis.Unlike Zero-Cross which only keeps track of the loudest frequency, full spectrum can clearly visualize quieter components of a echolocation call. 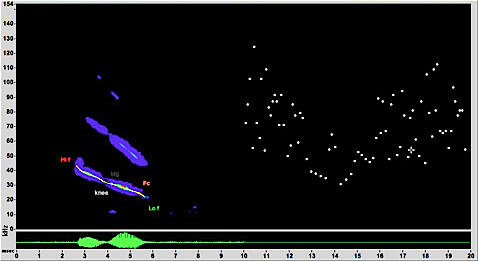 In building our classification engine, we have found these subtle components to have a massive import on accurate species identification.For example, for many Myotis species the final inflection of the echolocation call has a great deal of import for classification, but it is often quiet compared to the surrounding call. Worse still in zero cross this ending inflection can be \’masked\’ by echos from the earlier parts of the call.Without full spectrum this information cannot be reconstructed. Why limit yourself to one filter at your detector? With full spectrum data any filter setting can be applied to your data on the fly. Applied to our automatic classification engine, this means we can check for low frequency bats before excluding low frequency noise to improve classification of high frequency bats. Although call parameters from the time-amplitude domain do increase species classification performance, the primary benefit of full-spectrum analysis comes from increasing the robustness, accuracy, and confidence of metrics shared by users of zero-crossing methodology. In summary: full-spectrum provides higher quality results. 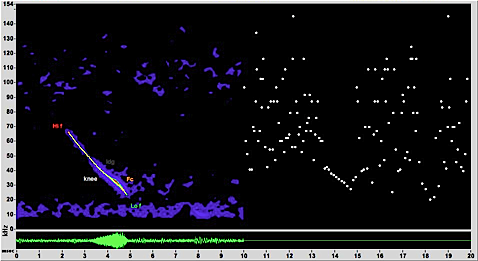 This approach enables and supports automated processing and classification of bat echolocation sequences in which the enhanced information content of full-spectrum data compensates for and decreases the need for human attention and artistry in the interpretation of less information-rich data. 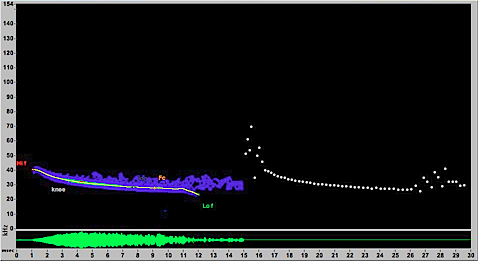 Full-spectrum processing rendered a complete time-frequency trend and confident determination of call parameter data /* http://sonobat.com/call-parameter-data */ from this Indiana bat call despite insect noise. Because zero-crossing analysis can only detect the strongest frequency component at any time interval, zero-crossing analysis of the same signal could not render a usable time-frequency trend because of the stronger low frequency content of the insect signal. 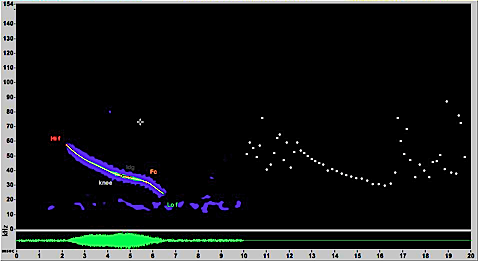 The overpowering concurrent signal amplitude that prevents full zero-crossing recognition of bat time-frequency trends more seriously affects bats that vocalize more quietly such as this Corynorhinus spp., shown beside the same signal rendered by zero-crossing. The multiple frequency content available in full-spectrum data enables tracking the time-frequency trends of calls to completion even when the call amplitude falls below the maximum amplitude of other concurrent signals. An example of a full-spectrum enabled time-frequency trend rendered through clutter echoes. 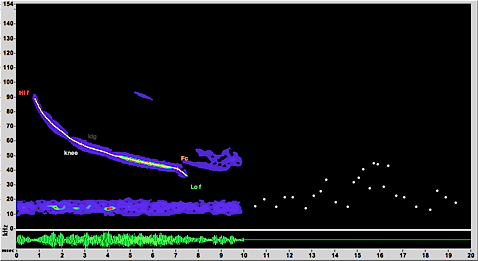 In this case, the ending downward trend in frequency readily discriminates this free-tailed bat from a hoary bat, whose calls tend to turn upward at the end. The zero-crossing analysis followed the stronger echo signals at the end of the call. Echoes from clutter often obscure ending details of calls. In this example, the time-frequency trend processed from full-spectrum data revealed the downward ending frequency trend that assists in recognition of this as a Myotis spp. call. The time-frequency trend as rendered from zero-crossing the same signal rises up at the end from the effects of noise and clutter echoes. The resulting trend has more features in common with an Eptesicus fuscus call than a Myotis call. Some bats like this Leptonycteris shift power among their harmonics, and zero-crossing trending follows the strongest power of these shifts generating interrupted time-frequency trends. Experienced zero-crossing users can recognize these shifts and make assumptions about call continuity, but they complicate automated analysis by zero-crossing. Full-spectrum processing readily generates an uninterrupted trend with such data. In this Corynorhinus townsendii call, the power shifts to the second harmonic late in the call, and the trend points from zero-crossing processing jump up to the higher powered signal. With access to multiple frequency content, full-spectrum processing can generate uninterrupted time-frequency trends from which to determine call parameters with greater confidence and detail for accurate species identification. With some species, the call fragments acquired from out of range bats, or noise-burdened signals processed by zero-crossing, can leave fragments that mimic the fully-formed calls of other species. 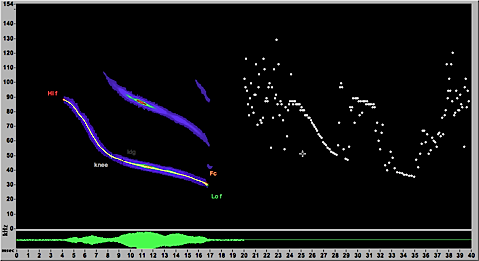 In this example, only the higher powered core of this Myotis thysanodes call rendered trend points from zero-crossing analysis and these left a signal that mimics aCorynorhinus townsendii call. The higher quality time-frequency call trends supported by full-spectrum data minimize this source of error.The amplitude and multiple frequency content of full-spectrum data enables assessment of signal quality. 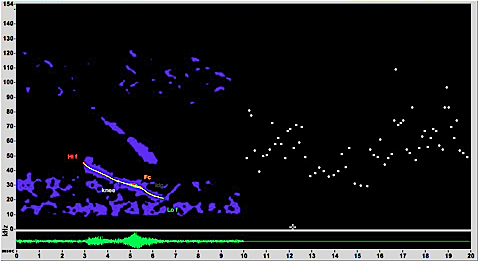 For example, one such measure, the signal to noise ratio (SNR), measures the relative strength of a signal of interest (the call) to the strength of the background signal level.Calls with low SNRs may generate unreliable parameters and are best excluded from contributing to sequence-level species classifications. This measure would reject the call in the above example. Such metrics provide essential quality control for automated call and sequence classification.